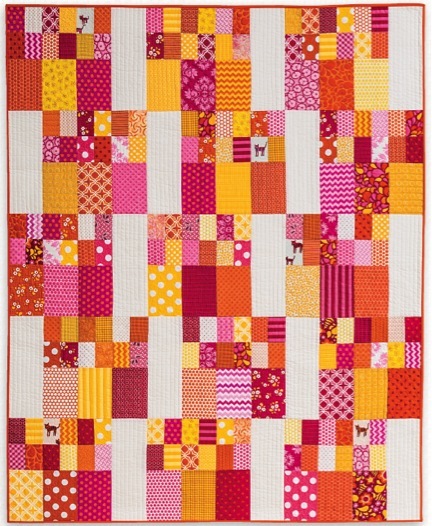 TheCitrus Squeeze pattern is found on p. 9 and is perfect for beginner quilters. It can easily be finished in one day. Simple rectangles and strips make this easy and stress free! 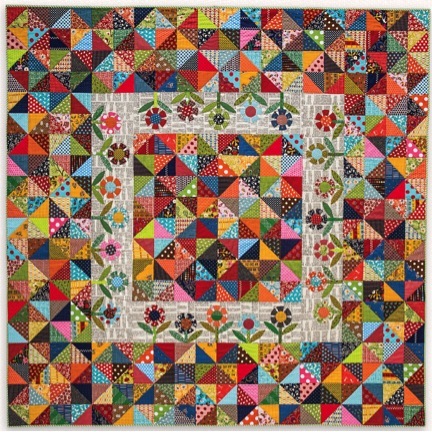 This quilt can be completely cut, pieced, and assembled in a single day. Offer fabric bundles or layer cakes in several color options. Suggestions include: baby pink, baby blue, patriotic for military quilts, and fun kid collections. Classroom cutting and pressing stations can be made available. Consider a theme for the day such as “Celebrating Baby” or “Military Service Salute,” and decorate a snack table with theme items. Offer specials on fabric bundles in the theme or colors featured. 1. Teach basic rotary cutting, accurate piecing, and pressing. 3. Explain how to add the sashing to the blocks. 4. Offer alternate color and theme fabric suggestions. 5. Once the basic instructions are given, quilters can easily sew and finish the quilt top in one day. 6. Suggest making an additional 13 blocks. Set the blocks 4 ´ 7 for a twin-size quilt. This class is for confident beginners to advanced quilters. They will learn needle-turn appliqué, wool appliqué, working with rickrack, and basic piecing for the borders. This class can be offered in dark, subtle folk fabrics or bright and wild modern fabrics. Best offered in a 2 or 3 part series. 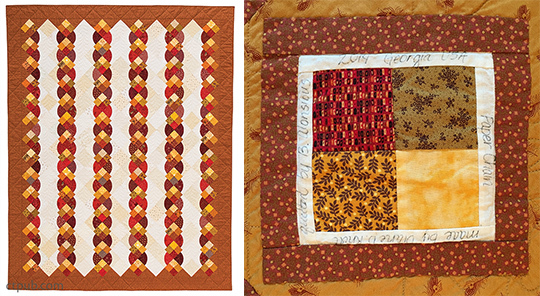 One lesson for needle-turn appliqué, one lesson for wool and rickrack, and one lesson for piecing tips and tricks. Offer wool kits and fabric bundles in several color options. Consider including rickrack in the class price for student convenience. Offer all appliqué products used in demos for sale. Good lighting is essential for appliqué. Cutting stations and pressing stations can be helpful to students. Lesson 1 covers all methods of appliqué and options for both hand and machine techniques. Students will bring finished block to lesson 2. Lesson 2 can cover accurate cutting, machine piecing, and block and border assembly. Consider offering students options for personalizing their quilts with names or dates in the lower part of the center block. This class is for beginners to advanced quilters. They will learn basic cutting, piecing, and pressing skills, as well as diagonal settings. This class can be offered in several color options (red and white, blue and white, batik on black, 30s on solids). Offer coloring sheet on p. 109. Best offered as a half-day or full-day class. Offer jelly rolls in several color options. Perhaps offer a backing fabric discount with the purchase of two jelly rolls. Offer rotary-cutting supplies, replacement blades, mats, and rulers as well. Cutting stations and pressing stations can be helpful to students. Make it festive by offering a theme or party atmosphere. 1. Discuss the importance of contrast and demonstrate high contrast vs. low contrast. 2. Instructions for making both blocks should be covered. 3. Proper piecing, pressing, and assembly, as well as adding setting triangles to diagonal rows, will also be helpful to cover. This class is for beginners to advanced quilters. They will learn basic cutting, piecing, and pressing skills, as well as appliqué methods. This class can be offered in several color options. Offer charm packs or fabric bundles in several color options. Perhaps offer a backing fabric discount with the purchase of multiple fabric bundles. Offer all appliqué supplies as well as rotary-cutting supplies, replacement blades, mats, and rulers. Cutting stations and pressing stations can be helpful to students. Make it festive by offering a theme or garden party atmosphere. Decorate the snack station with real daisies. 1. 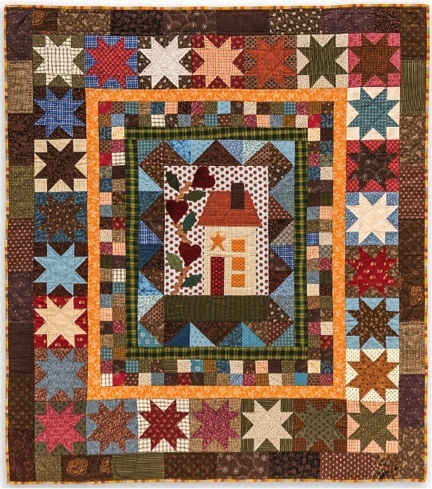 Demonstrate the machine- and hand-appliqué methods available, such as fusible or needle-turn. 2. Demonstrate the methods available for making half-square triangles. 3. Proper piecing, pressing, and assembly of blocks will be helpful to demonstrate as well. 4. 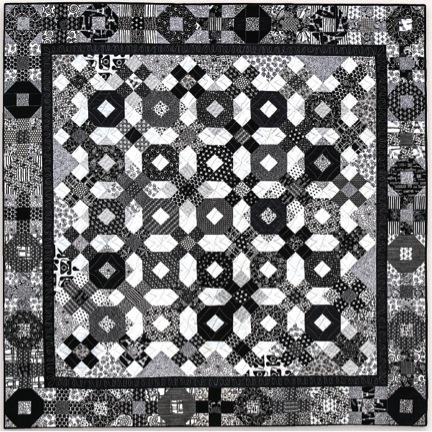 Big-stitch quilting as shown in the border can also be demonstrated. 5. Discuss label options as shown on p. 100. This class is for confident beginners to advanced quilters. They will learn basic cutting, piecing, and pressing skills, as well as curved piecing methods. This class can be offered in several color options. Refer to the coloring sheet found on p. 106. Offer fabric bundles in several color options as well as background bundles. Consider offering a backing fabric discount with the purchase of multiple fabric bundles. Offer all template-making supplies as well as rotary-cutting supplies, replacement blades, mats, and rulers. Cutting stations and pressing stations can be helpful to students. Make it festive by offering a theme or decorating with real paper chains. 1. Demonstrate the machine method for perfect four-patches and pinwheel pressing of the seams, found on p. 94. 2. Demonstrate the methods available for template making found on p. 96, as well as the methods for pinning and sewing curved seams found on p. 50. 4. Diagonal piecing with setting triangles should be demonstrated.